Like many secret nuclear weapons programs, the DPRK goes to great lengths to hide its capabilities to produce nuclear explosive materials and nuclear weapons. Despite these actions, a picture can be drawn of North Korea’s current and projected plutonium and weapons-grade uranium (WGU) stocks. Knowing these plutonium and WGU stocks can, in turn, allow an estimate of the DPRK’s current number of nuclear weapons and a range of projections of the number North Korea could build in the next several years. Although great uncertainty surrounds these projections, as well as the quality of North Korea’s nuclear weapons, these projections form a reasonable picture of the DPRK’s possible nuclear weapons futures, absent actions to significantly limit its nuclear programs. After summarizing estimates of stocks of separated plutonium and weapons-grade uranium as of the end of 2014, this report develops three projections of future nuclear arsenals through 2020: low-end, medium, and high-end nuclear futures. In developing these projections, which are intended to bound North Korea’s nuclear futures, a number of constraints are considered, including the number and size of nuclear production facilities, future underground testing, the extent and success of nuclear weaponization efforts, costs, and access to necessary goods and classified and proprietary technologies abroad. 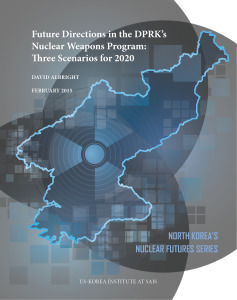 Download the report “Future Directions in the DPRK’s Nuclear Weapons Program: Three Scenarios for 2020,” by David Albright, founder and President of the Institute for Science and International Security. Learn more about the North Korea’s Nuclear Futures Project. Paper prepared for the North Korea’s Nuclear Futures Project at the US-Korea Institute at the Johns Hopkins School of Advanced International Studies, and originally published at 38North.org. The plutonium and weapons-grade uranium estimates through 2014 are part of a project that estimated plutonium and highly enriched uranium inventories worldwide that was generously supported by the Nuclear Threat Initiative.